The crew of 'Thaandavam' had earlier promised that they would bring Daniel Kish, believed to be the inspiration for the lead character played by Vikram in the film. As promised, Daniel Kish is now in Chennai. Having lost his eyesight completely 13 months after he was born, he hardly had any visual memory. Daniel Kish naturally started echolocating by making clicking sounds using mouth to ascertain at what distance objects are and he has worked it up to an art, almost! Having trained hundreds of visually-challenged people to see using their ears, one of his favourite hobbies is hiking in the mountains. "For the amount of travelling I do, I don't trek as much as I would like to. But if trekking was what I did for a living, I would do it all the time and I would like live out there in mountains," he says. That wouldn't be difficult for Kish as he already owns a trekking cabin in a mountain trail in Los Angeles. Apart from being the first visually-challenged person to acquire the National Blindness Professional Certification (NOMC) and being recognised as a Certified Orientation and Mobility Specialist (COMS), Kish is not a newbie to filmdom. "I have not participated in a feature film but have done many documentaries. I'm very familiar and comfortable with cameras. I was involved in a set show, but not as an actor but as a technical advisor. I had to train one of the actors for crime-drama series 'Criminal Minds' and I got to see how the whole production unit works. The whole experience helped me," he says. 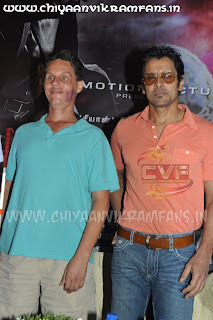 In fact, Daniel Kish has worked on the original script of 'Thaandavam' to make his character more real. "They presented me with a general script that showed the scene layout and dialogues. I was not being asked to mould a character, but to portray myself. So the dialogues and movements had to be almost exactly like my normal routine. So, director Vijay had agreed to allow me to adjust the script to include my personality, my speech patterns and the kind of things I would say and do," says Kish. But there were some difficulties during the first two days of shooting, "For one particular frame, I had to change my movements. It was a relatively minor thing and I just had to get used to it," he says. Kish is open to more such opportunities to educate people about echolocation and is visiting India in December again. "What is difficult is to make blind people get out of the practices they are already used to and re-adapt," he says.